Dubbed "The Nannies' Norma Rae" by The New York Times, Ai-jen Poo has worked for over a decade advocating for the rights of domestic workers with Domestic Workers United. Today, she joins us to discuss organizing with immigrants for labor rights. 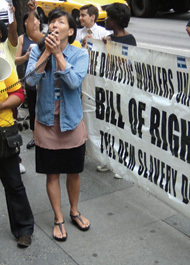 Dubbed “The Nannies’ Norma Rae” by The New York Times, Ai-jen Poo has worked for over a decade advocating for the rights of domestic workers with Domestic Workers United. Today, she joins us to discuss organizing with immigrants for labor rights. You can read about Ai-jen in the Yes! Magazine Breakthrough 15. She was chosen by Yes! as one of 15 heroes in their issue marking their 15th year in print.